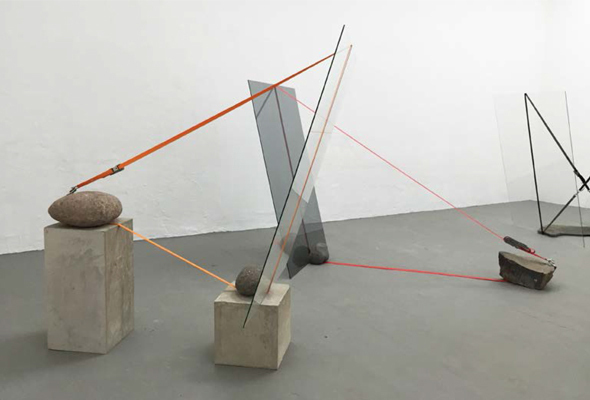 Jose Dávila, Joint Effort, 2015. Glass, boulders, concrete and ratchet strap, dimensions variable. Courtesy of the artist and Galería OMR, México. Jose Dávila’s work, nurtured by his architecture formation, is constantly referencing and revisioning the milestones and shortcomings of modern architecture, urbanism and contemporary art. Dávila approaches the vital contradictions between form and function in hybrid structures that are at once cold and warm, light and heavy, producing signs of functionality which are impossible to discern. Through sheer simplicity of construction materials, dialogue between emptiness and fullness, and between forms and spaces; Dávila performs a solid body of work on the illusory of perception, allowing him to devise and, disassemble ideas about art and architecture, their iconography and also their history. From the beginning of his career, Jorge Méndez Blake has explored the connections between literature and fine arts and has developed a large and varied body of work that alludes to the great masters of universal literature. In his work, Méndez Blake develops a visual language to engage classical literature through installations, drawings and interventions based on a multifaceted concept of the library—not just a repository of accumulated information, but also an object with infinite formal possibilities and a living institution whose purpose is the preservation of books and the dissemination of knowledge. The artist sees libraries not as isolated buildings, but as constructions that hold inexhaustible sources of information, and are thus able to create microsystems that address specific issues such as landscape or love. Function, by its simplest definition, is the purpose or task attributed to a thing. Form usually follows this intended use. In the workshop of de la Mora, form and function intermingle. His studio is an experimental laboratory of information where compulsive collecting gives way to obsessive ordering, categorizing, and standardizing of discarded and mundane materials. In this pseudo-scientific space, objects for which the primary function has expired or been canceled are reclaimed by the artist and transformed. Each material bears evidence of human interaction—the points of contact, the passage of time, the wear and tear of life. Inside the workshop, the sounds of these transformative processes fill the air with a repetitive hum—the striking of matches, the trimming of leather shoe soles, the counting of eggshell fragments—as the whole studio bends as one body to the task of revealing the narrative within the object. On the occasion of James Turrell’s 70th birthday in 2013, three major US museums honored the jubilee with extensive exhibitions. Each of the shows at the Los Angeles County Museum (LACMA), the Museum of Fine Arts, Houston, and the Solomon R. Guggenheim Museum in New York was different, and the one in New York, especially, caused an international sensation. For this exhibition, Turrell designed a complex construction that turned Frank Lloyd Wright’s famous rotunda into one of the artist’s largest perceptual spaces to date. At our booth, we present a set of inkjet prints on paper that arose from Aten Reign. Each of these three series was produced only once, each depicting a different moment of the installation. In continuation from Camil’s recent outstanding presentation at Frieze Projects NY. Look out for her wearable works walking around the fair. At what precise moment does an individual stop being who he thinks he is? If you cut off my arm, I say “me and my arm.” You cut off my other arm, I say ” me and my two arms.” Take out my stomach, my kidneys—assuming that were possible—and I say “me and my intestines.” And now, if you cut off my head, what should I say? “Me and my head” or “me and my body?” What right has my head to call itself me? What right?